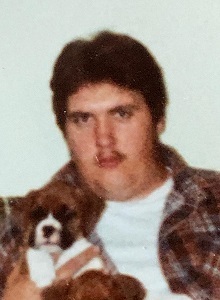 Michael John Gibson: 60, of County Road L East Troy, WI died Friday March 22, 2019 at Angels Grace Hospice Oconomowoc, WI. He was born February 16, 1959 in Meriden, CT the son of Joseph A. and Barbara A. (Brett) Gibson. He was united in marriage to Melody E. Horlacher on June 22, 1979 in East Troy, WI. Michael was a farmer and an agent with Met-Life Insurance Co. He enjoyed fishing and was a dog lover who raised and bred Boxers. He is survived by his wife of 39 years, Melody, his father: Joseph A. Gibson of Meriden, CT, his sister: Jeanne (Wayne) Cavanaugh of Wallingford, CT, two brothers: Joseph Gibson of Meriden, CT and Darren Willis of Denver, CO and by a host of other relatives and friends. He was preceded in death by his grandparents, his mother, and his infant brother, Russell. Visitation will be 1:00 PM until 2:00 PM Saturday April 6, 2019 at St. James Methodist Church 2945 Main Street East Troy, WI followed by a service at 2:00 PM. Memorials may be made in Michael’s name to: Katy’s Kloset 404 Wilmont Drive Waukesha, WI 53189 or Angels Grace Hospice W359N7430 Brown Street Oconomowoc, WI 53066. Online guestbook is at www.haaselockwoodfhs.com. Arrangements completed by Haase-Lockwood & Associates Funeral Homes and Crematory of Elkhorn, WI.